Tomatoes are awesome. From a crunchy Cobb Sandwich to a heaping slice of Tomato Pie, you can't really go wrong. And, tomatoes are the perfect thing for warmer weather eating. Chop them up into a quick salsa or purée with bit of olive oil, fresh veggies and herbs for a tasty gazpacho. Or, just eat them straight from the garden with a wee sprinkling of salt. Yummm. 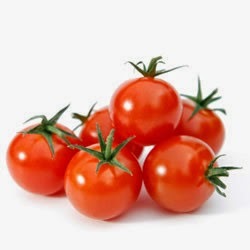 I love tomatoes. Love, love, love. So, you can safely assume that if there is a bowl of cherry tomatoes in the house I. Will. Eat. Them. All. The first dish has a bit of Asian flair to it, featuring ginger, miso, toasted sesame seeds and soba (Japanese Buckwheat) noodles. It's delightful either served cold or warm, and I will definitely be making it all summer long. 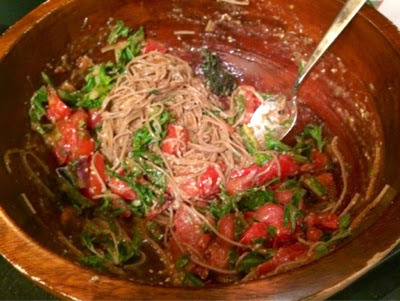 Honestly, Food & Wine magazine's recipe for Soba Noodles with Miso-Roasted Tomatoes is one of those dishes that you can imagine eating every week. It's perfect on its own, or you can add some grilled tofu, chicken, or shrimp. It would be terrific served along with grilled tuna, too. Or, just add some color and crunch: Chris had a great suggestion to add some raw kale in at the end--so good! Note: we doubled the amount of noodles in the recipe since we were eating this as our main course and 8 oz. of the thin noodles seemed a little sparse. It's up to you on whether you want to do the same. Just be sure to get the recipe here. Yum! The second dish is from a copy of one of my favorite food magazines: Lucky Peach (Winter 2013, Issue No. 6: Before and After the Apocalypse). 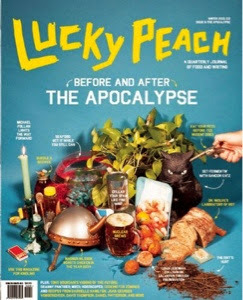 The entire issue was about surviving an apocalypse, and the recipe is supposed to use up all the items you'd have on hand in your pantry/basement/fallout shelter. (I personally would be sure to have a few extra bottles of wine and chocolate on hand, instead of tuna and tomato paste, but to each his own.) And in the meantime, it makes a pretty amazing dinner for a regular Tuesday night. Basically, you take some dried porcini mushrooms, cover them with water and bring to a boil. Then you let them simmer for 15 mins or so, until soft. Strain them and set aside, but keep the liquid. In the meantime, cook a couple tablespoons of tomato paste in a hot pan and then add some chopped cherry tomatoes (recipe is for canned, but use fresh if you have them), a tablespoon or two of Calabrian chili paste, and the reserved mushrooms, then simmer until flavors combine. Note: If you can't find the Calabrian chili paste, I've used both Tabasco sauce and Thai dry chili paste and the dish has still turned out great. Add the reserved mushroom liquid to a large pot, then fill it the rest of the way with water and bring to a boil for your rigatoni. (I've also made this with soba noodles.) Drain the pasta about a minute before it's done -- you're going to add it to the pan with the sauce and the noodles will keep cooking, so you don't want them to be mushy. When the sauce has cooked down a bit, season with salt/pepper and add some high-quality canned tuna packed in oil, then gently stir until heated through (don't break the tuna up too much). Add the pasta and lightly toss. Drizzle with more olive oil, and sprinkle a bit of fresh chopped parsley if you have it, and that's it. So good! See, it is true what they say. Life is a bowl of cherries...tomatoes.